Ironing must be one of the most important chores you would need to go through almost every morning. Experts have estimated that we spend almost three hours per week on ironing out our clothes. There are people who give their clothes to ironing shops and get their clothes ironed but most of us like to iron ourselves. And, for this, we need to have a good iron so that our ironing work will be easier. There are many types of irons but mainly there two types, dry iron, and steam iron. 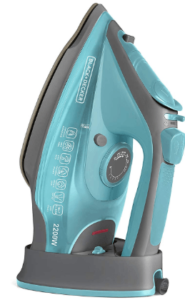 Dry iron and steam iron are same except steam irons produces steam for better wrinkle removal. We have already shared 5 best dry iron box article a few days ago, and now in this article, we are going to talk about 5 best steam iron boxes. Still, more people are using dry irons in the houses but steam irons are better as they remove wrinkles from fabric quickly. By the way, you should read our iron buying guide before buying an iron box online. Of course, you have several options when it comes to the irons, but the steam irons have been found to be one of the excellent choices. Lets us check out the best steam press for home use in India in 2018. There are several factors you would need to pay attention to before buying a steam iron. We will focus on the five salient features you should invariably be focussed on. Before you can think of anything else about your new steam iron, the most important aspect you need to take care of would be the sole plate. The non-stick nature of your soleplate will ensure that your clothes will not tear. Also, make sure that the sole plate is scratch resistant and offers easier cleaning procedure. Steam settings on your steam iron should be conveniently positioned. The amount of steam would have a bearing on the wrinkles and creases. You should also have a good number of vents for releasing the steam. It would be easy to distribute steam evenly. You should also look ahead to convenient controls for temperature as well. Wattage is yet another point one should take care of. Higher the wattage, the faster rate that it would get heated up. The higher wattage should also translate into a better steam output. However, please note that too high wattage on your steam iron would make it consume more power. Choose the optimum wattage. It may be preferable to go with a wattage of around 1000. Cord length should be one of the important aspects you may need to pay special attention to. An ideal length of 1.5 to 2 meters should be preferable enough. This will ensure that you will be able to have access to the corners and deeper regions without issues. Swivel mechanism would help using an iron without tangling of wires. It would also be practical to give a thought to cordless steam iron as well as it will provide an a=enhanced functionality. Since you cannot always check your kids out, it would be essential to ensure that your steam iron offers you the adequate safety measures. Make sure that the iron comes with enough protective measures including auto cut off, thermal shut down and other essential features. Now that we are aware of the best features you need to check out in your steam irons, we will list out the best steam iron box in India that you can buy in 2018. 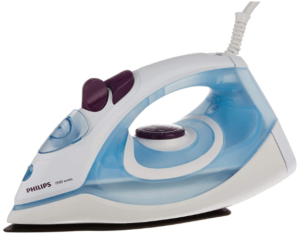 The Philips GC1905 1440-Watt Steam Iron with Spray comes from one of the best steam iron box brands in India and lives up to the image. The 1440 Watts of power should be what would make it an ideal choice by any means. Offering a finer spray, it would also offer you a steam output of up to 13 g/min. The Aluminium soleplate would be one of the excellent options that provide you with an excellent pressing functionality. The variable steam setting would assure customisable settings for your individual requirements depending on the clothes. You have access to 2 years warranty for the product. The fine spray helps you take care of the wrinkles and moistens the clothes in an even manner. The aluminium soleplate should help you for a smoother gliding. The weight is a little heavy. Water leakage can be an issue since many users have faced this problem. The iron needs to be kept in the horizontal position when not in use. Q: What type of coating does it come with? Q: Do I need to empty the water tank? Q: May I put it vertically when not in use? A: You should not put it vertically because it can leak. So, to prevent the leakage, it is advisable to keep it horizontally. 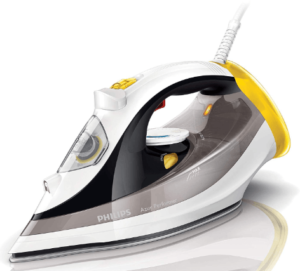 Philips GC3811/80 Azur Performer Steam Iron offers you auto steam control functionality and thus you do not need to worry about the proper steam setting anymore. The 250 ml capacity of water tank should help you get the best results for your ironing experience. The wide base of the iron should make it one of the excellent choices to go with. The vertical design would make it an excellent option for ironing your curtains and even other clothes as well. An excellent 2400 W of power. The pricing would be a little more expensive. Q: How much does the steam iron weigh? Q: Does it come with an auto shut off option? A: No, you may not get one. 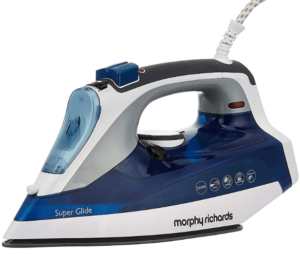 The Morphy Richards Super Glide 2000-Watt Steam Iron should be one of the best steam press you can opt for. As the name itself should be an indication, it glides quite smoothly over your clothes. The extra large tank capacity of 350 ml would ideally make it an excellent alternative. The soleplate is coated with the premium ceramic material and offers a super smooth run. The 2000 watts power would make it a great choice for all your needs in faster ironing. An exemplary 46 number of steam vents should make it an excellent choice by every standard. Q: What is the warranty available on the product? Q: What is the weight of the iron? 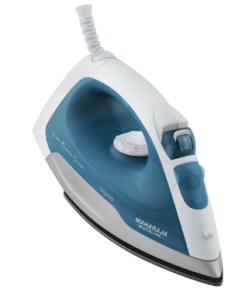 The Maharaja Whiteline Aquao 1300-Watt Steam iron has been one of the prominent options coming from one of the well-known brands and ideally the best steam press you can lay your hands on. The tank capacity of 170 ml should be ideal enough for all your requirements. The non-stick soleplate ensures safety for your clothes with smooth gliding. The 40 g/min steam spray should make it one of the best steam press for home use. It also comes with a soletip that reaches every nook and corner of your clothes providing a complete wrinkle-free experience. You also have access to the auto switch off function. 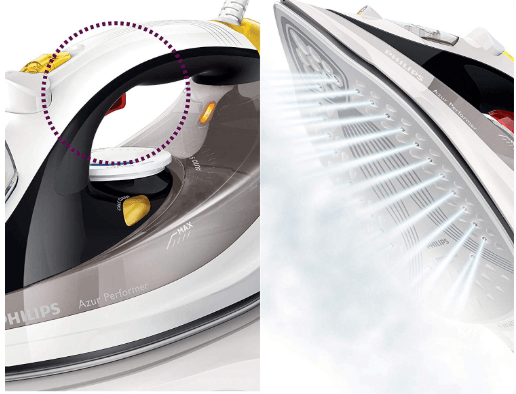 Dual functionality – switch between dry iron and steam iron. Its light weight would make it an ideal choice. It comes with an easy to follow temperature control mechanism. Since it has a wattage of only 1300 W, it can take a little time to heat up. Q: What is the cable length? Q: Does it come with self-cleaning mechanism? The Black + Decker BD BXIR2201IN 2200-Watt Cord & Cordless Steam Iron comes both in corded and cordless functionality. It offers you a powerful steam blast and makes it an ideal choice for a cordless steam iron. The ceramic soleplate ensures a high degree of gliding mechanism and prevents your clothes from getting stuck to the iron. The cordless steam iron functionality is one of the thoughtful inclusion. Address the stubborn wrinkles with the steam burst and steam spray function. You have access to variable temperature and steam control option. An extra large water tank capacity of 350 ml would be enough for a huge load of clothes. You get a 30g/min continuous steam output and 100 g/min steam blast. Anti-drip feature to prevent the water from spilling off from the soleplate. A slight amount of water dripping. Q: Can switch between dry and steam iron functionality? A: yes, you can make it work both the modes. Steam irons have been one of the prominent options for your needs in an effective ironing at home. We have made an attempt at helping you choose the best steam iron box in India through this compilation. We have tried our level best in providing you with the options in the best steam iron box brand in India. Check out the Pros and Cons of each of the listed steam iron and arrive at the best depending upon your preferences and requirements. Share your choices and reasons thereof with us through the comments here below.